This year, I will go to an early Thanksgiving dinner with my husband, son, daughter, daughter's boyfriend, daughter's boyfriend's parents, my mother, and three other people. Then, I will go to a late Thanksgiving dinner at my friend EDelMar's house, where he and friend Chuck will cook for the first time in their new kitchen. I'm looking forward to it!! Sounds wonderful. It's good to be around lots of FRiends and family. Happy Thanksgiving to all my FRiends in Denver! Miss you all somethin' awful! I know about two Thanksgiving dinners. Fortunately, mine aren't on the same day. I just got back from the first. It's a tradition that dates to 1982, when some college friends who had an off-campus apartment, decided to host a pot-luck Thanksgiving. That first year, I was still in the dorms, and didn't have a kitchen, so I just brought cranberry sauce in a can (yuk). We sat on the floor, the table being plywood resting on cinder blocks. We've been doing it every year since! 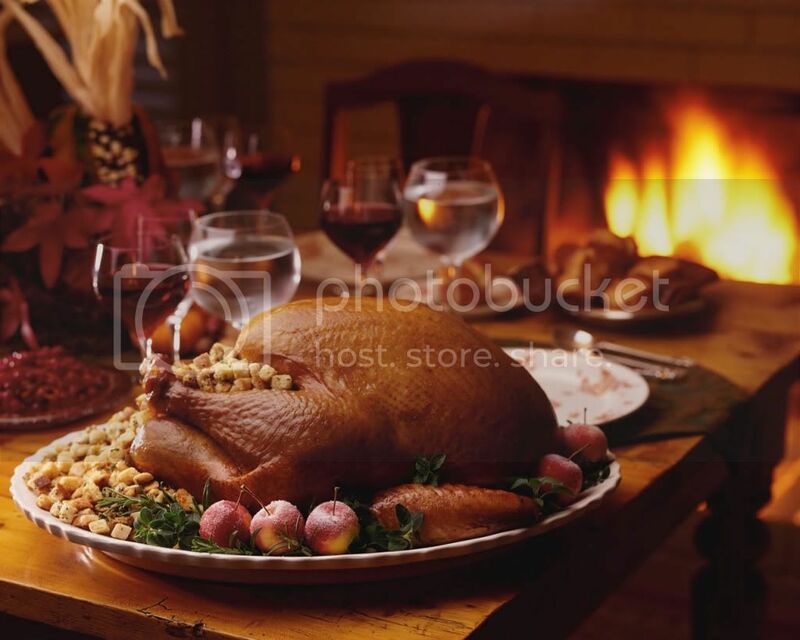 Whoever has the biggest house at the time offers to host, and cooks the turkey. Everyone else brings the rest. I still bring cranberry sauce, but freshly made with Cape Cod cranberries, oranges and fresh ginger (recipe is on the condiments thread here). It's always the Saturday before Thanksgiving. Nowadays, it may be the only time of the year I get to see some people. Now, there are lots of kids, straight, gay, couples, singles, (interestingly, fewer vegetarians). But the same core group of college friends--28th annual this year! The second dinner, on Thursday, I'll cook, for a much smaller crowd. I'm very thankful for my wonderful, loyal friends. I'm guessing you all don't sit on the floor 28 years later. I love that your canned cranberry sauce has evolved as you have! I'm thinking of putting pomegranate juice in mine this year. I'm sure your friends are thankful of you...and that your cranberry skills have evolved! I just made a big recipe of Mama Stamberg's cranberry relish. It has really awful sounding ingredients--raw cranberries, sour cream, horseradish--but it is delicious. Susan Stamberg gives the recipe every year on NPR and it's on their web site. I'll try your recipe for Christmas, Paul!! Pomegranate juice sounds wonderful, Clarissa!! Happy Thanksgiving to all American Brokies!!! May the turkey be as tasty as you expect! Red wine is good to everything!! Thanks Sonja and Berit! Happy Thanksgiving to everyone!